Our medium-duty single-axle tow trucks are great for towing large delivery trucks and single tractor units. Why use a 30- to 50-ton wrecker to tow a 24-foot box truck or smaller motor coach when we have the right equipment for the job? 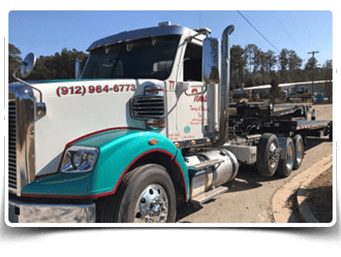 Using the right truck for the vehicle to be towed means greater efficiency and cost savings for us, which we pass on to our customers by offering very competitive rates. Our 60- and 30-ton tow trucks can handle all of your heavy-duty towing and recovery needs. We tow tractor-trailers, concrete mixers, garbage packers, buses, fire trucks, motor coaches — any size road-legal vehicle is well within our tow truck capacity. “M.S. Savannah,” our flagship truck, is a 60-ton Century rotator designed for one-lane recovery with minimal lane blockage and a range of other heavy-duty tow and recovery applications. This technology enables our operators to easily and safely tow and/or recover extreme amounts of weight and large vehicles. Our rotator can extract large vehicles from unusual angles and positions without the need for a crane. 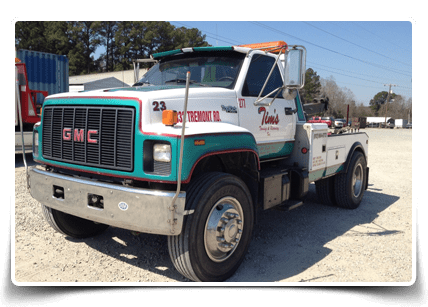 Tim’s Towing & Recovery Service has extensive experience in rotator use as we were the first towing company to introduce a rotator to the Savannah area in 2001. Our experienced tow truck operators are trained and certified in areas like air cushion rescue and recovery, so our customers can be assured of safe and professional vehicle recovery and towing. We are a service provider for Fleet Net, The Towing Network, Volvo Action, KW Premier Care and many other commercial vehicle fleet networks.